LIVERMORE, CALIF. — Sandia National Laboratories and industrial gas giant Linde LLC have signed an umbrella Cooperative Research & Development Agreement (CRADA) that is expected to accelerate the development of low-carbon energy and industrial technologies, beginning with hydrogen and fuel cells. A new agreement between Sandia National Laboratories and Linde LLC will focus on performance-based design approaches to commercial hydrogen fueling stations and may lead to their proliferation. 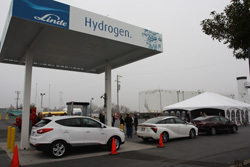 On Dec. 10, Linde opened this hydrogen fueling station in West Sacramento, the first-ever, fully certified station of its kind. (Photo courtesy of Linde LLC) Click on the thumbnail for a high-resolution image. “Sections of NFPA 2 are typically not utilized by station developers, as they instead have focused more on rigid distance requirements for fuel dispensers, air intakes, tanks, storage equipment and other infrastructure,” explained Sandia risk expert and fire protection engineer Chris LaFleur. “Linde’s business interests in building and operating more hydrogen fueling stations for retail use align perfectly with our research goals aimed at accelerating clean and efficient energy technologies into the marketplace,” said Chris San Marchi, lead researcher in Sandia’s hydrogen safety, codes and standards program. “With Linde’s help, we’re developing a science-based approach for updating and improving the separation distances requirements for liquid hydrogen storage at fueling stations,” said LaFleur. Previous work only examined separation distances for gaseous hydrogen, she said, so validation experiments will now be done on the liquid model.